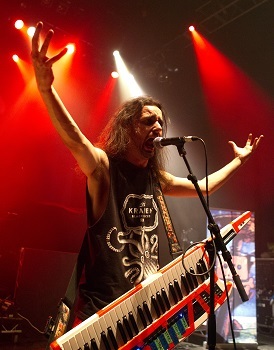 I spoke to Chris Bowes, Singer and songwriter with Alestorm, and Keyboard player/songwriter for Gloryhammer. I asked him about the new Alestorm album, Sunset on the golden age, their tour plans, and of course, Alcohol. Chris: Apologies for the noise, I'm right in the process of making Margaritas, but we can start. Festivalphoto: It's got to taste better than the Pimms you were drinking at Sonisphere. Chris: That was awful, really bad. Pimms is alright when you make it properly, but that was warm and straight from the bottle - not a recommended drink I must say. Festivalphoto: Your new album, "Sunset On The Golden Age" is due for release in a couple of weeks time. Presumably the title refers to the Golden age of piracy rather than the golden age of Alestorm? Chris: Definitely. Alestorm's best is still to come I'd like to think, so yes that is what the title refers to. To be honest I don't know that much about real historical piracy, but that title was something that just sounded cool, the album has nothing really historical about it. Festivalphoto: "Surf squid warfare" has to be the song title that caught my attention first. Clearly you've chosen to focus on boring historically accurate songs for this album. Chris: Oh yeah, as everyone knows there are plenty of historical records that say in the 17th century a bunch of pirates acquired a time machine then travelled to the future to kill an undead army of space squids - it's in all the history books, so that's probably our most historical song on the whole album. Festivalphoto: Youve got songs on the album about Quests (Quest for ships), Alcohol (Drink, mead from hell), pirate stuff (Walk the plank, Wooden leg), but it looks like no songs about wenches on this album. Chris: No we've all decided we prefer the company of men on this album. I think you're right, there are no wenching based tales on ths album. Maybe next time we'll ramp up the misogyny. Festivalphoto: On the last album you sang about scraping the barrel, and on this one some fans will no doubt say that's what you've done by covering Taio Cruz. Chris: Yeah, what a good song that is, a great little tune. Festivalphoto: In the past you've covered a song from the Eurovision song contest (wolves of the sea) and the Village people (In the navy), and now you've covered Taio Cruz. Why choose his song "Hangover" to cover? Chris: I was listening to the radio one day in the car and this song came on , and I was like "oh my god this is perfect - It's about drinking, it's a completely catchy melody, and it's just perfect for Alestorm. We'll worry about the rap bit later" We managed to get the rap section sounding cool, and I just love it. I think the most exciting thing is how much that's going to annoy so many people. There's going to be a lot of people get seriously pissed off "There's rapping in my metal album, bleurgh". Festivalphoto: It should be fun to watch the outrage. Festivalphoto: The album is available in all the usual formats including vinyl, but the best one has to be the box set with an Alestorm hip flask. Have you been given a flask? Chris: They've all sold out. I've got five of them though, the record label sent me them. Festivalphoto: They sent you them, or you "found them" in the Napalm office? Chris: They actually sent them me for free, so I've now got five hip flasks in my possession. Festivalphoto: Well they'll come in handy - that's enough alcohol for the first part of any gig. Festivalphoto: I've got my copy on order. Chris: You managed to get one? They sold out really quickly. I was expecting that they'd still be trying to sell them off years from now, but they're all gone, which is reassuring I suppose..
Festivalphoto: Definitely, and they've also released a second box set, this time with an eye patch. Chris: Yep, an eye patch......I saw that email in my inbox saying about eye patches, and was like "Oh god, what are you going to do? ", but it's cool I suppose if you like wearing eye patches. Festivalphoto: How did you enjoy playing Sonisphere? You were on fairly early. Chris: I think Tesseract were on the main stage before us then we played on the second stage around 11.30 or something dreadful like that. It could have been worse to be honest. The crowd was great and it's definitely the biggest show we've played in the UK so that was nice for starters. I was looking forward to getting back to the UK, because that's the first show we've done in the UK for over two years now, so it's nice to be back again. Festivalphoto: You had quite a few crowd surfers, including some dressed as pirates. Chris: It's always reassuring when you look out into the audience and see a bunch of guys in pirate hats and things - you know who your fans are then. Festivalphoto: You had a large crowd - obviously not including those people already waiting at the other stage for Babymetal. Chris: I tried to catch the end of their set. They're a very strange band. I saw them walking around backstage doing their press, which was so weird because they had this massive media circus around them, "oh my god what is going on here". Festivalphoto: I hear you were winding up some unsuspecting journalist who didnt check their facts and thought you were playing later in the day rather than knowing you'd already played. I hear you told them Babymetal were guesting with you. Chris: That was a good little bit that was. You've got to pass the time somehow. Doing interviews all after noon is very err, very..
Chris: It just drains you, so you've got to make up a few stories to pass the time. Festivalphoto: You've got a few more festivals this summer before you tour Europe and the UK in September and October as "Piratefest". Chris: yes and I'm looking forward to that one a lot. It's been years since we toured the UK and now we get to come back with a big headlining package tour with every band going to be dressed as pirates and singing about pirates. It's going to be a ridiculous ridiculous time and I cannot wait. Festivalphoto: It's the first time in Europe for Lagerstein. How do you think they'll cope with proper beer after being brought up on Fosters? Chris: You cannot imagine the amount those people drink. My other band, Gloryhammer, we played with them a few months ago. After a day of heavy drinking, for a quiet warmup, the bass player downed 17 jaegerbombs in a row. There is no drinking challenge that they cannot meet, it's ludicrous. You know the drinking game Centurion? Chris: It's a game where you set a timer and every minute an alarm goes off, and then every minute for a hundred minutes, you drink a shot of beer. So you drink 100 shots of beer in 100 minutes, and by the end of it, the average person gets completely pissed. They were doing it with rum, so 100 shots of rum in 100 minutes. You cannot imagine the liver capacities of these people, so I don't think British beer will faze them in any way. Festivalphoto: You'll have to get them on the strong Belgian beers then. Chris: They can drink absolutely anything. Good guys though. Festivalphoto: You've been announced for the 70,000 tons of metal cruise. Is this the second time Alestorm will have played? Chris: For Alestorm its the second time, for me it's the third because Gloryhammer played it this year. That's going to be great beacuse it really is the best thing you can ever do in your life, and I get to do it again. We're possibly going to use it as a launch pad from which to do a US tour which will be fun. Festivalphoto: You've announced Japanese dates for November plus a date in South Africa for April next year. Both of these will be your first trips to these countries. Chris: It's our first show in Africa and our first show in Asia, so we're ticking the continents off. Then we'll have played every continent apart from Antarctica, so we need to get an Antarctica show going at some point. Festivalphoto: I didn't realise you'd played South America already. Chris: Yeah we did a show in Sao Paulo, Brazil and also Buenos Aires, Argentina, last year, but we want to get back there again and do some more. Festivalphoto: South American fans tend to be very enthusiastic, so I can imagine an Alestorm gig there is crazy. Chris: It's pretty wild. A lot of fun. Festivalphoto: You released some sad news last month, announcing that Bumilingus has come to an end after 5 years. Had you run out of poo jokes to sing about? Chris: We just got bored of that band and want to do something else. Myself and the other guys in Bumilingus want to start a different band, maybe sing about robots or killing people. I'm always going to start a new band, don't worry about that. Festivalphoto: You don't seem like the type of guy to take a few months off to relax - you're constantly writing something. Chris: I've got a lot of spare time, but I get bored easily so I'll write a new album or start a new band. It keeps the creative juices going. Festivalphoto: Now the Alestorm album is done, it'll soon be time to start writing the next Gloryhammer album. Chris: That's the idea. Once this one's out it'll clear my mind a bit and I'll be straight on with writing songs about wizards again. You can definitely expect a new Gloryhammer album either very late next year, or early the year after. Wow that seems so far away. Festivalphoto: When you do more Gloryhammer gigs they'll be bigger and better than the first one at the Little Devil in Tilburg. Chris: That was a rough gig. Now we're a much better band, and the crowds are much bigger. We played a slow last week at the Rockharz festival in Germany. At the end there were like 10,000 people kneeling down in front of us, it was totally insane. Festivalphoto: Right from the start I could see Gloryhammer were likely to go down very well at the big festivals like Graspop and Wacken. I don't think you've played Wacken yet though have you? Chris: No we're really trying to get that next year. The thing is they'll probably give us a really crappy slot, so maybe wait a few years for that one. Festivalphoto: ok time for some consumer advice questions on important subjects.....What are your top recommendations on brands of Rum ? Chris: Flor de Caña, from Nicaragua. They do some seriously aged rums, they do one that's aged for something like 25 years and it's like drinking syrup. It's so good. That's probably the best rum I know. There's all the mainstream crap that people drink like Captain Morgans, which isn't actually nice, it's pretty rough. There are some pretty good rums around though. Festivalphoto: Stroh 80 is a pretty rough one. Chris: Oh yeah that Stroh stuff is nasty, it's pure alcohol essentially. The Europeans can't do rum. Austria doesn't even have a sea, how can they make rum? I don't get it. Festivalphoto: Top choices of beer ? Festivalphoto: I've tried a few of the Belgian cherry beers but not that one. Chris: It's not like the Kriek cherry beers. They're like a lambic beer that's ben sweetened with cherries whereas this is a brown ale that's been sweetened with cherries. It's tasty. Festivalphoto: That sounds good - I'll definitely keep an eye out for it. Chris: You're welcome. Have a great day and all that stuff. Party on.